On July 26-27, several members of the Ophir Lab attended a small mammal preparation workshop led by Jeff Bradley, the Burke Museum’s Mammalogy Collections Manager. 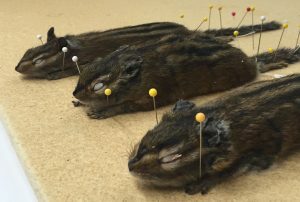 During this event (sponsored by the Cornell Lab of Ornithology and Cornell University Museum of Vertebrates), we learned how to prepare museum-quality specimens of mammalian skulls and skins. The natural history data collected on the pelages, muscles, internal reproductive organs, and skeletons of these animals will be used to better understand how environmental conditions and biodiversity change together across evolutionary time.